Directly from the observer's immediate physical or social environment through his human senses. Indirectly through the channel of symbolic language. The first relies solely on direct experience and perception. The second requires the observer to interpret written symbols that represent the experiences and percep­tions of others. The first is not perfect but it is reasonably robust. The second is riddled with fallibility. For my observations of society related herein, I have relied as much as possible on direct experience. Unfortunately, in order to interpret my observations as conveyed through this book, you are forced to rely entirely on your ability to interpret my words as I meant them. A foreknowledge of the nature and limitations of this second form of communication will hopefully equip you to be able to compensate for the shortcomings in my powers of perception and expression, thereby reducing any misinterpretations of what I have written to an acceptable level. The superior strength of the human species lies in its ability to pass on knowledge from one generation to the next. I have had the privilege of learning the discoveries of Sir Isaac Newton and of appreciating the experiments of Michael Faraday. But they both died long before I was born. I could not therefore observe them through direct experience. A complementary human strength of ever grow­ing significance today is the ability to exchange knowledge quickly over great distances. Through short wave radio I was able to learn about for­eign lands and cultures directly. But I never had, nor am I ever likely to have, the means of travel­ling to these places to observe them directly. Knowledge has been passed on down the centuries by legend, song and book. Now for future generations we can add the extra realism of film, magnetic tape and optical disc. For centuries, knowledge has been passed over great distances by messenger and mail. Urgent messages were sent via chains of fire beacons and semaphore flags on towers. Knowledge is now exchanged much more quickly by cable and radio. But knowledge from a distant place or from an ancient time can never be received quite as it was sent. Observation over time or space suffers from something that immediate observation does not. It is called degradation. As with the motions of the heavenly spheres, so in the communication of ideas, time and space share a strange equivalence. Time and space, or rather the media they contain, degrade and corrupt the information through which ideas are conveyed. If I go to Rome, I can see the remains of the Coliseum built by the ancient Romans. The structure I see is not, however, what the Romans built. I see what has become of what the Romans built after it has been eroded by over 2000 years of deterioration. A lot of imagination is required to try to see the precision and splendour of the original structure as it would have appeared at the time it was completed. 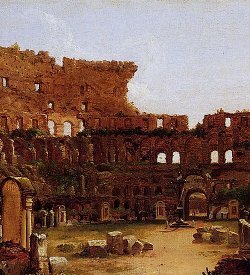 We can think of the Coliseum as a physical medium within which was recorded the original majestic design. From its appearance today, we see that its information content has suffered severe degradation over time. All recordings suffer this same degradation with time. Often, while listening to an absorbing short-wave transmission from a foreign land, I am overcome by frustration as the signal fades below the noise level at a crucial part of the commentary. Its signal is weakened by distance. It is distorted by ripples in the ionospheric ocean. What I hear is not what was sent, the whole of what was sent, and nothing but what was sent. In the summer before I started infants school, I played some old 78rpm records that my father inherited from his father. Playing them again in my late teens out of curiosity, I could not believe that recording quality had been so bad in those days. But this was not really the whole story. Although inferior to what I had become used to, the sound had not been as bad as that originally. 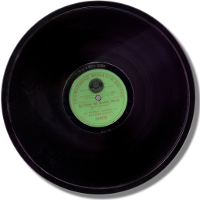 Over time, chemical decay in the recording material had caused the more acute wiggles in the grooves of the record to become rounded, causing loss and distortion of the sound. 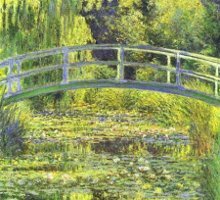 Monet was a painter. I like his pictures. They invoke in me sensations of happiness and tranquillity. While creating his pictures, he would undoubtedly have had to work out his scenes and how best to express them on canvas. Monet was French. He would therefore carry out his reasoning in French. I do not speak French. I would not understand anybody who tried to speak to me in French. But this does not stop me from appreciating Monet's paintings. Art transmits thoughts and feelings without the use of language. Bach was a composer. I like his music. Whether it be played on a harpsichord, piano, by full orchestra, or on a modern synthesiser. Bach's music does not lose its appeal to me even when heard through the bland tone of a sine wave oscillator. In the late 1960's, I used to get pleasure from hearing it generated by a program that simply keyed a computer's input/output bus to which were attached an amplifier and loud-speaker. Bach was German. He would therefore reason to himself in German as he composed his music. I do not speak German, nor would I understand anybody speaking to me in German. But this does not stop me from enjoying Bach's music. Music also transmits thoughts and feelings without the use of language. In both short wave broadcasts and mechanical recordings, the sound is sent or held in what we call analogue form. It is transmitted or preserved in a form similar to the way a painting stores a scene. Each line, shape and colour in the scene has a directly corresponding line, shape or colour on the canvas. The scene is represented in a physical form that is a direct analogy of the scene itself. There is a direct one-to-one correspondence between each point in the scene as the artist perceives it and each point in the painting. Likewise, the sound waves of the broadcaster's voice are represented by analogous electromagnetic waves that are transmitted from the radio station. Each point in the pattern of the sound waves has a direct one-to-one correspondence with each point in the pattern of the transmitted electromagnetic waves. And each point in the pattern of sound waves produced by the orchestra also has a direct one-to-one correspondence with each point on the carved groove of my grandfather's 78rpm records. If the painting is left outside in the weather, its colours will bleach and run. Its representation of the scene will become less faithful. What the artist painted is not quite what critics of the future will see. If a record is left out in the sun, it will warp and buckle. Its groove will no longer follow the wave-form of the original music. Even if protected, both painting and record suffer chemical deterioration which, over time, will destroy their original fidelity. Electric storms and ionospheric motion fade and distort distant radio broadcasts. The pattern of electromagnetic waves received is no longer a perfect analogy of the broadcaster's voice. A book is different. It too is made of a mortal fabric that suffers the same deterioration and decay. However, what is written within the book is far less affected by the ravages of time. The centuries of light may brown its pages and fade its ink. But so long as its letters are still correctly recognisable, it can still be read. Its lack of physical comeliness does not diminish the beauty of the author's prose. The ancient facts related within it are just as clearly conveyed. The fundamental thing about the words in a book is that they can be reproduced perfectly. An artist can never truly recreate the work of an ancient master, but a scribe can give perfect rebirth to the words of an ancient prophet. Some years ago, a self-styled office artist drew a rather rude cartoon of an unpopular manager. It spread far and wide. 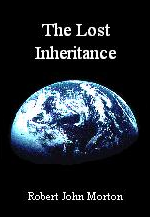 Long after it had become forgotten, somebody discovered an old copy. It was obviously a copy of a copy of a copy ad infinitum. It was barely recognisable. My office colleagues and I were frustrated because we could not get back the quality and impact of the original cartoon. Later, on my return from a trip abroad to gather some technical information, I found that the photocopies I had been given were of a similar quality to the cartoon. But I could still read them. Just. So all I had to do was re-type the parts I needed. I then had a perfect copy. That is the difference. We can recall and imagine pictures, sounds and the inputs from other human senses. However, abstract thought requires language. The language of thought is sound-based. Writing is simply a means of preserving those sounds. But the written word is not an analogue of the spoken word. Its form and shape show no clue as to the sound it represents. For written communication to be possible, the sound represented by each written word must be foreknown identically by both writer and reader. Musical manuscript also represents sounds by symbols. The five lines on which the notes are placed are drawn in ascending order of pitch or frequency. 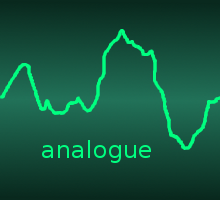 Nevertheless, unlike a waveform displayed on an oscilloscope, they are not a true analogical representation of the music. The shapes of the written symbols are arbitrary. They are a matter of convention rather than natural constraint. One civilisation chose the symbol 'm' to represent a certain sound. Another civilisation chose the symbol 'µ' to represent the same sound. Neither looks like nor creates any impression of the sound it represents. A picture is an analogue representation of a scene. A letter or word is not an analogue representation of its sound: it is a symbolic representation. The price of the added robustness of symbolic communication is the need for a key: foreknowledge of what sound or thought each symbol represents. The keys held by sender and receiver must be identical. If they differ even slightly, the message will be corrupted. If they differ too much, it will be irretrievable. The same principle of encoding into symbolic form and decoding back again using the same key has been applied in modern times to the more rapid electronic methods of sending information across time and space. Semaphores, Morse Code and the ASCII code used by computers are examples of 'symbolic languages' for doing this. Other digital codes are used for carrying speech through telephone networks and for recording music on optical discs. They are also used for high quality broadcasts. Speech or music is captured by a microphone as an analogue signal. The magnitude (height) of this signal is measured every x microseconds. It is then coded as a binary number eg 111001001. Each number is sent or recorded as a train of pulses all of the same strength. These may get distorted en route but each will always be discernible as either a 0 or a 1. The receiver or player then reconstructs a perfect copy of the original sound by generating a pulse every x microseconds of the magnitude specified by each binary number as it is received. Thus there is nothing resembling music on an optical disc. What is recorded is, in effect, a set of instructions on of how to recreate the original music. So the disc player must have built-in foreknowledge of the language in which those instructions are written. If it does not, it won't have a clue as to the kind of sound it should produce. Similarly, in digital telephony, what is transmitted across the network is, in effect, a set of instructions telling the receiver how to reconstruct the sound of the caller's voice. The advantage over analogue methods is the same as that of the scribe over the artist. No matter how the signal has been degraded by time and space, provided its individual elements (letters) are still recognisable, the receiver will reconstruct the original sound perfectly. If on the other hand, the individual elements themselves become indiscernible, the failure of a digital recording or telephone call is catastrophic. Both the written language of books and the digital encoding of sound can preserve well any message sent across time or space. However, the validity of what is received depends critically on the recipient having the correct key. 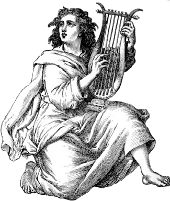 If a digital recording had been made of David playing his harp to Saul, the key to its digital encoding could have been written in a book. From it, people today could have constructed equipment with the same built-in key and we would have been able to hear correctly that soothing melody. But suppose we think we have the correct key when in fact we don't. Suppose also that the recording we are listening to is from an ancient and alien culture whose notions of what is, and is not, music are totally different from ours. How can we determine whether or not the sound we are hearing is the sound that was originally recorded? We can't. We are completely reliant on having the right key. In fact, by deliberately building a changeable element into the key, we can encrypt a digital telephone call so that only the legitimate participants can hear it intelligibly. A relatively simple piece of electronics reconstructs faithfully a caller's speech from the coded information carried by a digital telephone link. 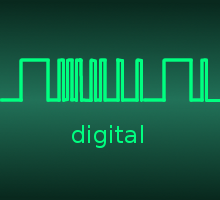 The digital signals represent symbolically the caller's vocal sounds. The vocal sounds, in turn, represent symbolically the caller's thoughts. Therefore a further process must take place in the recipient's mind to translate the vocal sounds back into the caller's original thoughts. The receiver's electronics needs a key to interpret the digital pulses into the vocal sounds they represent. So too the recipient's mind requires a key to interpret the vocal sounds into the caller's thoughts. Words on a printed page represent, symbolically, corresponding spoken words. The interpretation of the written word into its spoken equivalent is performed by the reader's brain. However, this level of interpretation is equivalent to that done by the electronics in the digital telephone. An artificial neural network can translate written words into spoken words. But that same further process as before must take place in the reader's mind to translate the sounds (whether actually vocalised or not) back into the writer's original thoughts. Again, the reader's brain (or the artificial neural network) needs a key to interpret the written words into the vocal sounds they represent. So too the reader's mind requires a key to interpret the 'vocal' sounds into the writer's thoughts. The first syntactic key comprises the vocabulary and grammar of the spoken language or digital code that relates a set of symbols to a set of sounds. The second semantic key is an amalgam of all our personal experiences of nature, life and society that relates the spoken word to thought, significance and meaning. 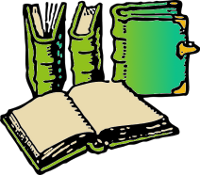 For a reader to understand perfectly the words of the writer, the reader must be in possession of the writer's semantic key. Since no two people share exactly the same fundamental experiences of life, such perfect understanding is clearly impossible. To be able to share exactly the same fundamental experiences of life, people would have to occupy continuously exactly the same position in time, space and society. The self-evident fact that this cannot happen is perhaps another manifestation of the well-known spatial exclusion principle, whose natural effect has been to give to every individual a unique set of experiences. This means that no two people in the world can ever share exactly the same semantic key, so can never communicate perfectly. Although their semantic keys cannot be identical, they can be close. 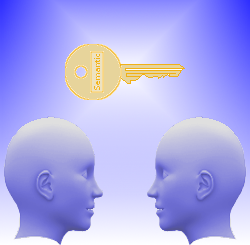 People with similar experiences will have closely matching, and therefore more compatible, semantic keys. Which people are close and which are not close is not always obvious. For instance, a middle child in a family may be closer in experiences to the middle child of another family than he will be to his own elder or younger sibling. A British miner may be closer to a Russian miner than to a British accountant. To remain close, people need to communicate. Communication engenders common interests and therefore furthers common experiences. Isolation makes people drift apart. Their interests and experiences diverge. They rapidly become strangers. It can happen to parents and children when the children grow up and leave home. It can happen to school friends who go their separate ways and meet later in life. It happened to me when I met some colleagues with whom I once worked every day. The physical constraints of time, space and human physiology make it impossible for every individual to communicate with every other, even if they all had the same semantic key. Every individual is isolated from most others. He is able to communicate only with a limited number of people that we refer to as his coterie. His semantic key will therefore become more and more tuned to the keys of those within his coterie, and more and more out of tune with the keys of the rest of humanity. Fortunately, different people's coteries overlap, forming a patchwork of communication and isolation over the demographic landscape. Coteries can also be extremely non-homogeneous. Some members of a person's coterie may be local while others live on the far side of the world, held together by an inspired common interest. They may belong to a variety of specialised professions, classes or cliques held together by no more virtuous a bond than plain economic interdependence. Within this fluid patchwork emerge sets of individuals whose personal coteries overlap to the extent that they are largely co-incident. These crystallise into externally recognisable social groups. Communication among their members is much more intensive than it is with outsiders. The minority overlapping of individual members' coteries with those of other social groups provides vital links with the outside. These permit and sustain active, though less virulent, inter-group communication. Increased sharing of experience within these groups tunes the semantic keys of their members ever closer. This gives rise to a group-speak or sub-language that grows less and less understandable to outsiders. Each trade, industry and profession has its own jargon. Government departments force us to communicate with them through their own constrictive language of tick-box forms. These all exert a force that tends to reduce the fidelity of communication and thereby drive groups apart. Some disperse all over the planet to form separate nations and cultures. Others are held in spatial proximity while being poles apart in mutual understanding. My mother tongue is English. I can usually understand it even when it has been written by non-English speakers. When Japanese electronics products first came to Britain in great quantities, their instruction manuals were difficult to understand. They contained English words and syntax, but these were set according to the rules of Japanese grammar and idiom. The semantic key was for the most part Japanese. Working out what they said was, at times, frustrating and often amusing. Differences in geographic relief, climate and resources have given different cultures different experiences of the basic workings of nature. This has led them to classify existence in different ways using different naming methods and grammars. It has made them think differently. This has given them a different national philosophy, ideology and language. This is the real origin of the language barrier. While my daughter was studying for her degree in English & History I tried reading her Middle English version of "Sir Gwain and the Green Knight". Although it was in its own strange way recognisable as English, I think I would have fared better deciphering a legal contract in Swahili. The fundamental thoughts and perceptions of that Middle English writer were quite different from mine. But the story was intriguing. In both cases, the semantic keys of reader and writer were incompatible, twisted by space and time. So what we saw at the syntactic level, we now see also at the semantic level. We see that same strange equivalence of space and time. We see how both cause information to become degraded. Errors in communication, resulting from differences in language and culture, are an obvious cause of international misunderstanding. Language diversity and cultural evolution are known barriers to understanding ancient texts. But a growing gulf in understanding between the different socio-economic classes, which now transcend international boundaries, is not so obvious. Technology is continually reducing the economic necessity for human effort, both physical and mental. Because of our antiquated socio-economic structure, this results in a society ever more sharply polarised into rich and poor. National economies are becoming increasingly specialised and mutually dependent. This is causing technical expertise to become internationally polarised. The demand for my skills has shifted to various parts of the Third World. Consequently I am unemployed. The country in which I live regards the unemployed as undeserving. Consequently I am poor. I have been relegated to a minority class whose experiences of life and society are significantly different from those of the employed majority. In these days of unemployed professionals, poverty can wear wealthy clothes. Its presence is no longer obvious. But it is just as debilitating. The consequences of poverty are more far-reaching than is imagined. For example, in Western capitalist democracies, a person's freedom of movement is considered to be a fundamental human right. But poverty denies a person that right more certainly than if it were denied by law. Freedom of speech is another. If what one wishes to say would offend or disturb those of the elite establishment, then the doors to public media close. And without money, one cannot oneself publish, advertise, broadcast or in any other way seriously and effectively commandeer pubic attention. Without money, the world is a closed door. Therefore, if you are not unemployed and poor, or if you hail from a foreign land with a different mother-tongue, or if you are a historian looking back from my distant future, then it is almost certain that the mental frame of reference or semantic key that I used to encode these my experiences and views into the words of this book is quite different from yours. My note of caution is therefore that only those who have shared my lot can ever understand fully those things of which I have written. This book is my view of society seen from where I stand within it. It is the embodiment of my life-long abhorrence for social disparity and injustice, and my search for a better way. But beware. That subconscious semantic key with which your mind will try to unlock my words may be very different from the one I used when writing them. What you read will be what I wrote, but what you perceive may not be what I intended. Unless, that is, being forewarned of the dangers, you bury all prejudice and proceed with an open mind.